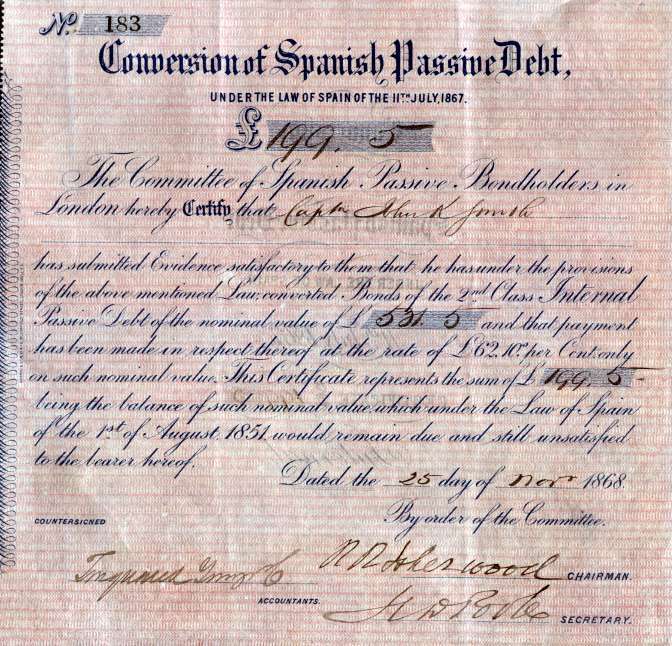 Beautiful RARE Conversion of Spanish Debt certificate from the Committee of Spanish Passive Bondholders issued in 1868. 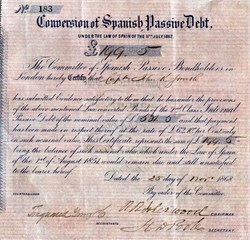 This historic document has Conversion of Spanish Debt printed on top center. This certificate was hand signed by the Committee Chairman, Secretary and Accountants. Foreign Stocks � The Spanish Passive bondholders have, at a full meeting, decided to refuse the terms proposed by the Spanish Government for the conversion of the bonds. The chairman of the bondholders' committee, who had very injudiciously thrown all his personal weight into the question, and against the resolution as well as the interests of the bondholders, has resigned his seat, and has been replaced by the proposer of the resolution, by which the settlement decreed was rejected.